I want to thank everyone for their kind wishes these past few weeks during my bout with pneumonia. I seem to be on the mend now and I am finally beginning to feel human again. Even though the weather is absolutely horrid and I have no intention of going out again until it is time to get on the plane for Arizona at the end of the month. The snow banks are piling up out there higher and higher. It is deceiving when I look down from my apartment windows at the snow below. It is much deeper than it looks from up here! One thing about being so sick is that I realized I need to take better care of myself. As you know I am always doing things for my family. Most times I do too much. I was wearing myself into the ground. There are many days I am so busy running errands and doing things for others that I don't get my own things done. I know it looks like I do a lot of art but I really don't do as much as I want to or should be. I was very worried about turning 65 at the beginning of the month. I had no idea of course I would get so sick for my 65th birthday. Turning 65 is quite traumatic for me. Medicare. Social Security. Yikes. I am going to be saying "no" more and more to my family. I have to for my own self preservation. They are going to have to figure things out for themselves. I can no longer fix everything, nor do I want to. Everyone is a grown up now. Even my grandson. He is 15 now and I have done all I can do. It is up to him now. 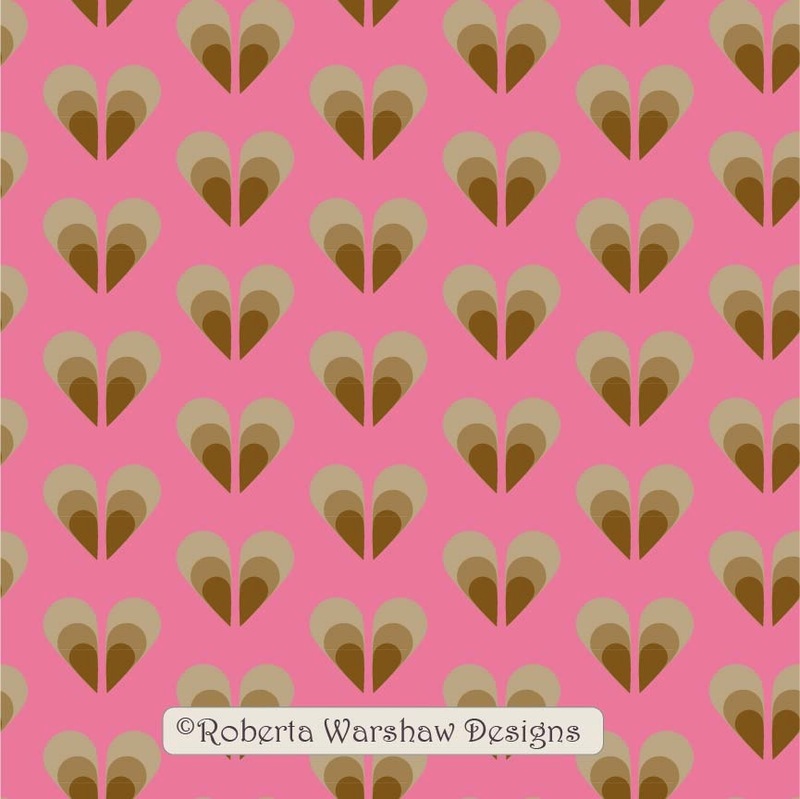 I leave you with my little Valentines Day pattern! Have a good week everyone and thanks again for all your get well wishes. It has meant a lot to me these past few weeks. Take care of YOU, Roberta! Nice work and glad you're on the mend. I am sorry that you have been so Unwell. I hope you will enjoy your time in Arozona,which sounds so special. The most loving thing you can do for your family is to take care of yourself, and accept the care they extend to you. Be as gentle and nurturing to yourself as you have been to others! Also, I will just add that I have had great benefit from acupuncture, especially for rebuilding from a depleted state. If you can find a clinic style practice, it is much more affordable. Glad to hear you're getting better and made a few decisions about how you're going to stay that way. I was the sole parent for years and quickly realised I had to make my health and well-being a priority so I could be well and happy for my kids and I had to make sure they would be able to stand on their own two feet. Parenting, and grandparenting is difficult: we naturally want to protect and support but there comes a time we have just have to let them do it themselves and sometimes damn hard watching them make a decision that you think may not be the best. Learning to deal with the consequences of decisions made can be a hard but necessary life lesson. Kia kaha - Stand strong.